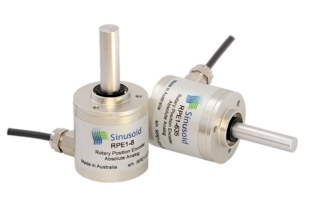 Sinusoid Pty Ltd has just released new range of its rotary encoders. They offer 10 bit resolution and come in several output formats. These are based on contactless magnetic encoder chips from Austriamicrosystems. Manufactured in rugged anodised aluminium and built with dual ball bearings they offer high speed continuous rotation up to 7500rpm. There is a v-ring seal which provides IP50 ingress protection for speeds up to 3000rpm.